PENANG will host 31 participative sports events which will promote eco-friendly tourism next year compared to 49 this year, said state Youth, Sports, Women, Family and Community Develop-ment Committee chairman Lydia Ong Kok Fooi. 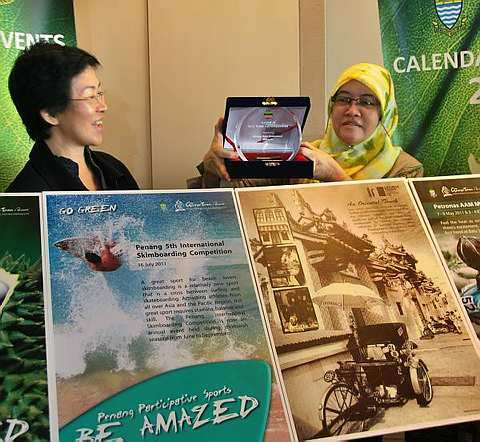 “Only three events will produce carbon emissions,” she said when unveiling the ‘2011 Calendar of Events’ at a hotel in George Town on Saturday. The events are the Petronas AAM Malaysian Cub Prix, Penang Annual Offroad Buggy Challenge and Orange Day (remote control car challenge). Among the events lined up are the Walk for Sight 2011 Charity Walk, Penang Kayuh Lasak 2011 Mountain Bike Jamboree and Penang Open Angling Competition. The events are organised in collaboration with the state’s various sports associations. Ong said the event calendars would be available in hotels and at the Penang International Airport alongside ‘Visit Penang’ brochures. She said a roundtable discussion with Thailand and Jogjakarta to promote tourism in the region was also in the works as a result of the state government’s participation in the Tourism Promotion Organisation for Asia Pacific Forum 2010. The forum was held in Vladivostok, Russia, last month. “We will work closely with the authorities from the two places and other cities in Malaysia to exchange views and promote tourism for the region,” she said. Ong said the state won the ‘Best Print Advertisement Category’ with its ‘Be Amazed’ posters at the forum.